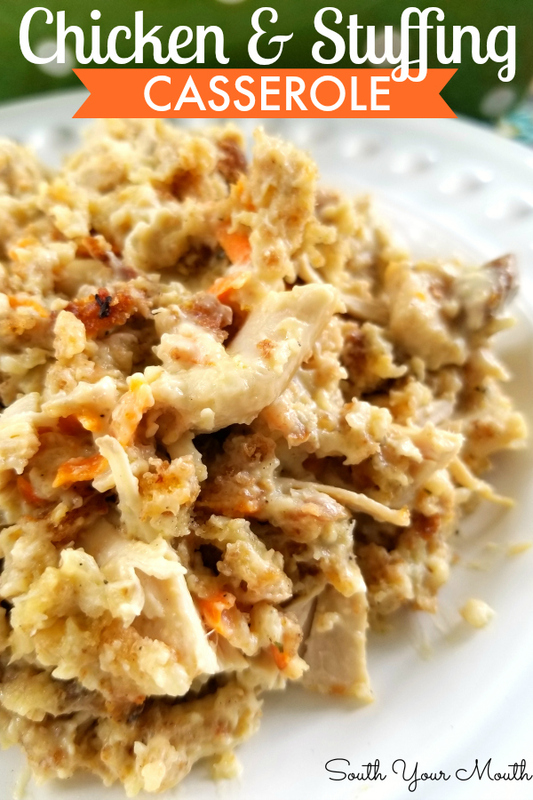 An addictive comfort food casserole recipe with Pepperidge Farm stuffing, sour cream and chicken. 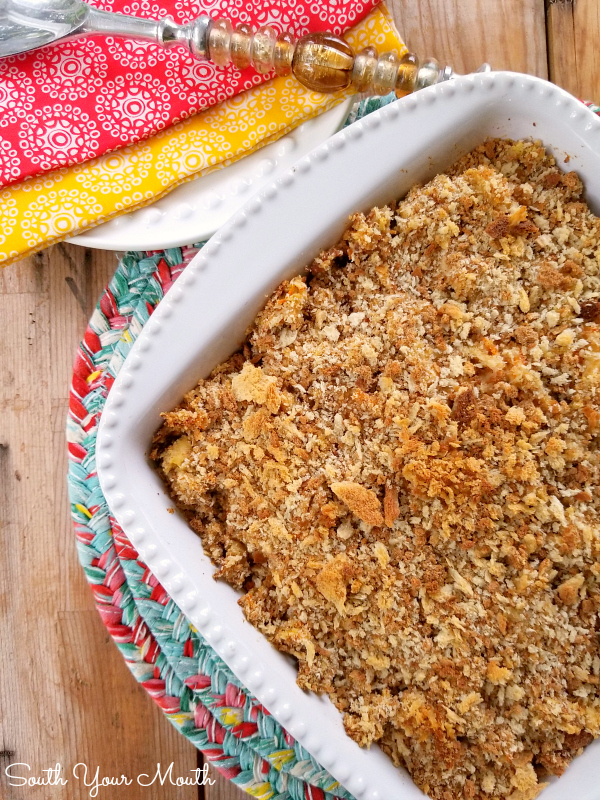 One of my VERY favorite recipes is Mama's Squash Casserole. You know the one with the Pepperidge Farm stuffing and sour cream? UMPH! I could eat the whole thing by myself! Seriously. It’s almost shameful how much I love that stuff. I will literally get out of bed, tiptoe downstairs and heat up the leftovers in the middle of the night. 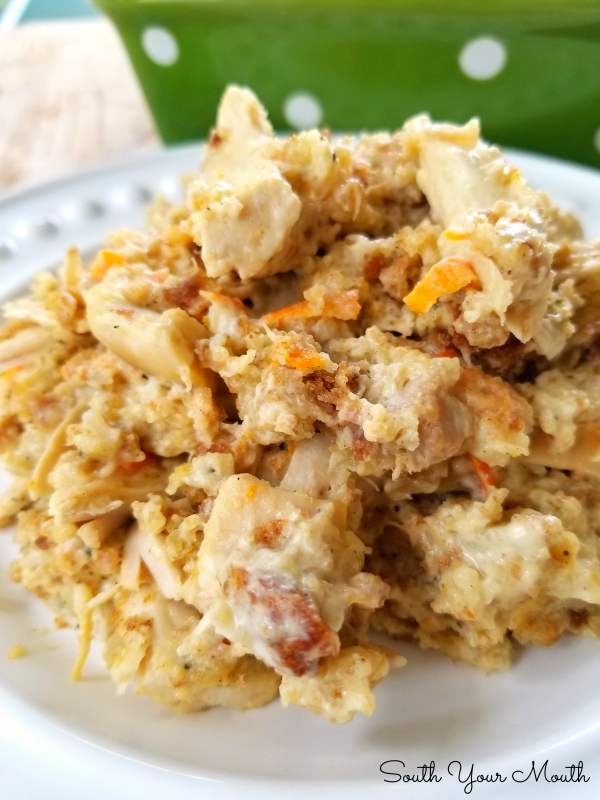 So I got to thinking… since I love it so much, why not use the same recipe to make a main dish casserole with chicken (instead of squash)! Which is exactly what I did. I added some stock and a little more butter since we wouldn’t have the moisture from the cooked squash but everything else is pretty-much the same. You’ll notice the recipe calls for GRATED onion and carrots. Grating the veggies in this (and in the Squash Casserole) recipe “chops” them fine enough that they won’t need to be sautéed before going in the casserole (the heat from cooking the casserole will cook them enough). If we were to dice them (even finely), we’d need to sauté them first so they wouldn’t be crunchy. If you don’t have a box grater (which is what I use) or a food processor, you can absolutely dice the onion and carrots instead. You’ll just need to sauté them in the butter from the recipe before mixing in with the other ingredients. I thought about adding celery to this but I wasn’t sure what sort of stringy mess I’d end up with if I took my box grater to a stalk of celery. I do think the flavor would be great though! If you’re going to have to sauté your onions and carrot, I’d consider throwing some celery in there too! Place chicken in a stock pot then add just enough water to cover. Season with salt and pepper (to taste) then cook chicken over medium heat until chicken is cooked through. Remove chicken from stock and set aside to cool. Reserve stock. 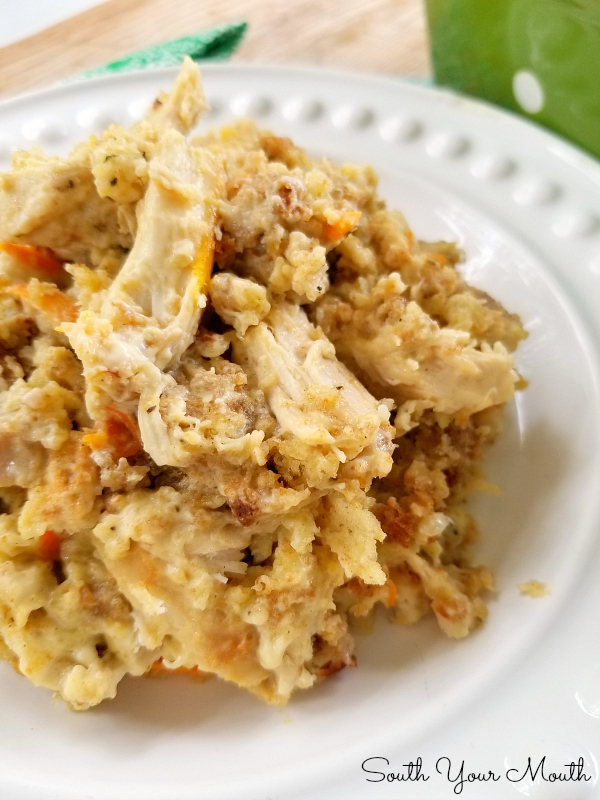 Once chicken is cool, shred with two forks or cut into bite-sized pieces. Add onion, carrot, cream of chicken soup, sour cream, butter and 1/2 cup reserved chicken stock then mix well. Fold in 3 cups of the stuffing. Add more stock per preference. You want the consistency to be how you like your dressing at Thanksgiving (which varies from person to person). Taste for seasoning then add more salt and pepper if desired. Add mixture to a 2-quart baking dish then top with remaining stuffing. Bake at 350 degrees for 30-40 minutes or until golden brown and bubbly. Cover dish loosely with aluminum foil if stuffing starts to brown too much before dish is bubbly. You can absolutely use a rotisserie chicken (or other leftover chicken) if you prefer. I just cook mine since the recipe needs chicken stock/broth and I’d rather use homemade than buy it. If you decide to use cooked chicken, be sure to add chicken broth to your grocery list because you’ll need it in the recipe. I use my box grater to grate the onion and carrot. By grating the veggies we don’t need to sauté them first (they’re grated fine enough to cook up tender when cooking the casserole). If you don’t have a grater (or food processor), finely dice the veggies then sauté in the butter before adding to the recipe. This recipe doubles beautifully. The 14-oz bag of Pepperidge Farm stuffing has about 7-8 cups of stuffing in it. Use 6 cups in the recipe then top with the remaining stuffing. I think this could be made in a crock pot. If you want to try it, I’d start at 3-4 hours on low or 2-3 hours on high. 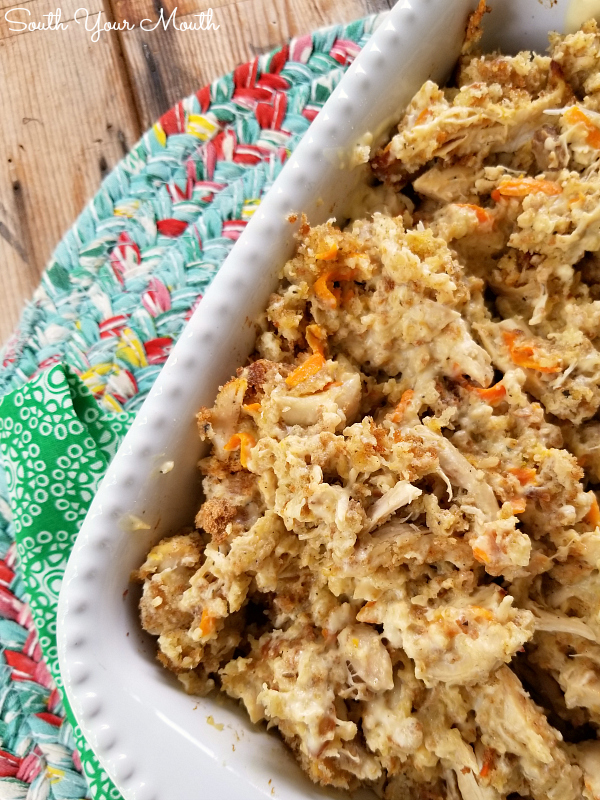 You can use the Pepperidge Farm CORNBREAD stuffing in this too! I’ve never made this with other brands of stuffing so I’m not sure how they would turn out. I love this recipe for summer squash casserole. Instead of sour cream I use french onion dip. And I use Stove Top - chicken flavor as a starter base for the stuffing ingredients. Can I use Stovetop Stuffing instead of Pepperidge Farm Stuffing? I've never made it with other brands so I'm not sure how it would turn out. I think Stovetop is a bit saltier so maybe use low sodium cream of chicken soup. This sounds good, and I'm in the mood for some comfort food. Think I'll throw the onions, carrots and some celery in the water to cook split chicken breasts then use that yummy stock in the casserole. My mouth is watering just thinking about it! I'm curious if I could use the chicken and the squash? I'm always looking for creative ways to use summer squash, but we are definitely meat eaters in my house!!! OMGosh! Two high fives Mandy! I made this recipe tonight. I added a cup of broth and when I make it again, I'll add a bit more. RE the carrots and onions - I popped them in the microwave for about 2 1/2 minutes with the butter rather than using a grater. The next time I will add celery to the onion/carrot mix. It was awesome and was told it is a keeper recipe. Wondering if this can be frozen for a freezer meal? I think so! I would prepare it then freeze without baking. This was way too much trouble. I've been making a similar recipe for years that is so much easier. I just put shredding chicken in the bottom of a casserole dish then spread a can of soup over that and top it with prepared dressing. 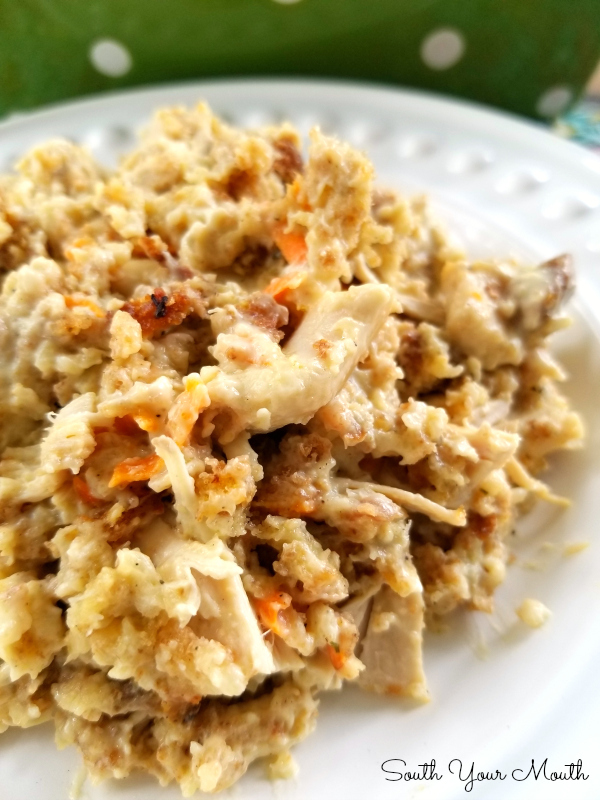 Back in the '70s there was no Stove Top dressing or boneless skinless chicken breasts so I stewed a whole chicken and shredded it by hand and I used prepared Pepperidge Farm dressing over the top. Baked as this recipe states and it was so good but now I use all the shortcuts I can, cooked & shredded boneless skinless chicken breasts and prepared Stove Top. Don't get me wrong, this is very good and I followed the recipe, but I won't go to all that trouble again. There are easier just as good ways to do this. Huh? The only thing different about this recipe and what you're talking about is some grated veggies and a carton of sour cream so how is that too much trouble?? I think this is DELICIOUS and way better than just soup, chicken and stuffing. I make this at least once a month! My mother-in-law had a very similar recipe as this that I use. I always use rotisserie chicken from the grocery in mine and store bought chicken broth. It is so easy to make and soooooo good. Comfort food to the max! 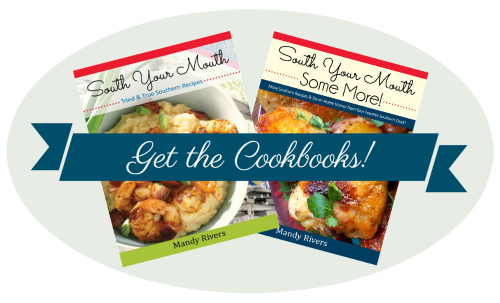 Thanks for your fantastic recipes.